Ganjuwala, a very old type kukri famous for its colorful case and more tools at its back side now comes with a full tang blade. This is a very old kukri and very famous among farmers and villagers in the remote eastern Nepal. 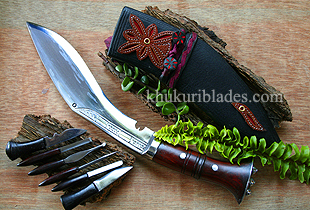 Unlike other kukris, this kukri has a number of small tools along with the basic sharpner and small knife at the back of its case used for different purposes thus making it handier and special during trekking and jungle tour. The small extra tools are a chisel, a hole maker, a ear cleaner (a must for villager to kill his time when he has nothing to do) and a tweezer. It also has a extra hole for a pencil to go in if needed to carry one. It also comes with a small pouch at the back of its case to carry dry straws, coins, matches and lime stones or anything valuable. This kukri also has a colorful case making it attractive. This Ganjuwala panawala 8" has a full tang blade for sturdier handle.